Home > Market News > Markets Are Bearish – Time to Be Bullish? Markets Are Bearish – Time to Be Bullish? Friday brought an end to the black-streak for oil prices, the longest up-streak since 2010 as markets rebounded from the ’08-’09 financial crisis. This morning crude oil is sustaining Friday’s losses. Crude oil is currently trading at $51.15, a loss of 44 cents. Fuel prices are mixed this morning, after both products gave up a few pennies on Friday. Diesel prices are currently trading roughly flat around $1.8753, losing just 0.4 cents. Gasoline prices are trading at $1.3871, down 1.4 cents from Friday’s close. Because of the government shutdown, the CFTC has not published its normal Commitment of Traders report. The CFTC monitors futures markets and records all trades above a certain size, and gives lagging indication on the bullishness or bearishness of the market. A high net open interest suggests more bullish bets than bearish; a low net open interest suggests the opposite. The last report, released in late December, shows net open interest of crude oil among managed money (hedge funds, ETFs, etc) at the lowest point since 2016, a year when prices sank as low as $35/bbl. As Warren Buffet, one of the most famous investment managers in the world, said, it is wise to be “fearful when others are greedy and greedy when others are fearful.” It’s typically when bullishness hits a low that prices tend to change course and move higher. 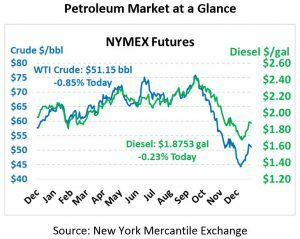 With bullish positions so low, now appears to be a good time to evaluate your market risk to determine whether you ought to lock in fuel prices for 2019 and beyond.